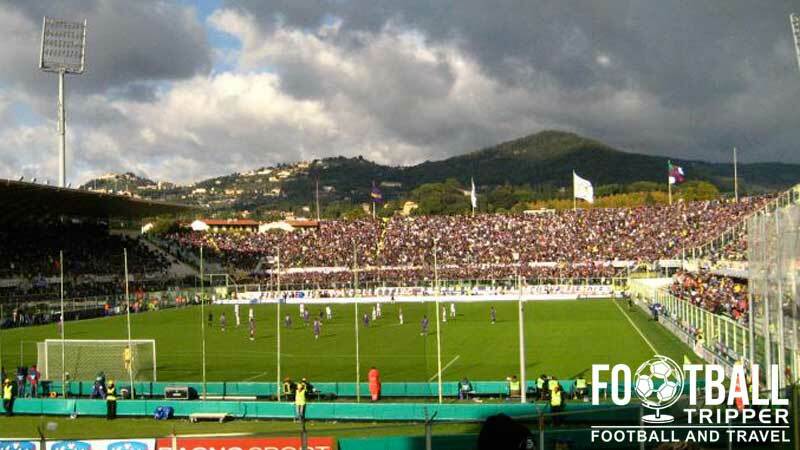 Stadio Artemio Franchi is a football stadium home to ACF Fiorentina who are based in Florence, Italy. The ground is famous for being built entirely of reinforced concrete and like a lot of other stadiums in Italy, it was last renovated for the 1990 football World Cup. Fiorentina’s stadium first opened on 13th September 1931 with a friendly match against Austrian Side Admira Wien. Initially named in honour of Giovanni Berta who was regarded by the far right as a “martyr of the fascist revolution”, the stadium was constructed during the era of Mussolini, and was used to stir national pride. Hosting matches of the 1934 World Cup which Italy went on to win, nationalists would have argued that it was a great success however immediately after the culmination of the Second World War, fascism fell out of fashion, and the ground was renamed to simply Stadio Communale. Extensively renovated for Italia 90, the second Italian World Cup gave Florence’s Communale Stadium it’s current form, most notably the removal of the athletics track and the expansion in seated places. Prior to this the official attendance record was set at 58,271 on 25th November 1984 during a match against Internazionale. Renamed to Stadio Artemio Franchi in 1991 in honour of the former FIGC president, the existence of Marathon Tower is perhaps the only obvious relic of Il Dulce’s reign. A popular architectural piece of their day, towers were included in the design of many Italian stadiums in the 1920s including Bologna’s Renato Dall’Ara, and Torino’s Stadio Olimpico. 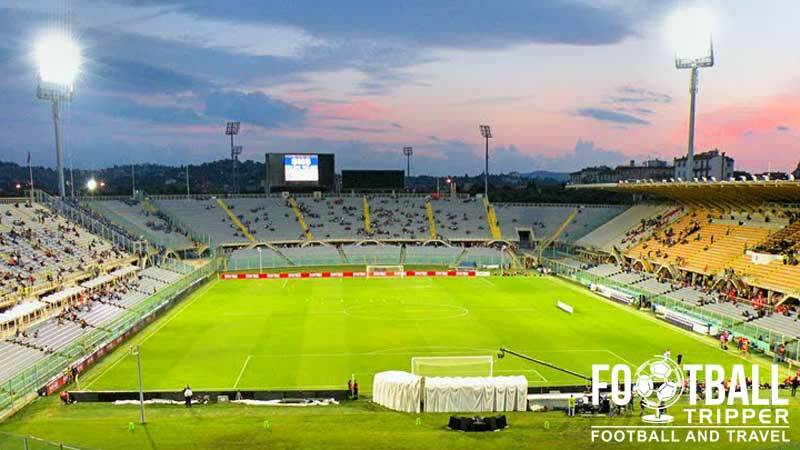 Since 2012 the club have been in talks with the city of Florence to construct a state-of-the-art 40,000 capacity stadium within the Mercafir Area of the city. Expected to cost over €300m, the iconic helix staircases and other prime examples of Italian Rationalism may not be around for much longer! Artemio Franchi is comprised of the following four stands: Curva Fiesole (North), Tribuna di Maratona (East), Curva Ferrovia (South) and Tribuna Coperta (West). Away fans who make the trip to Florence are housed within the south-east corner of the stadium within sections OS1 – OS3 which are accessible from gates 13 and 14. 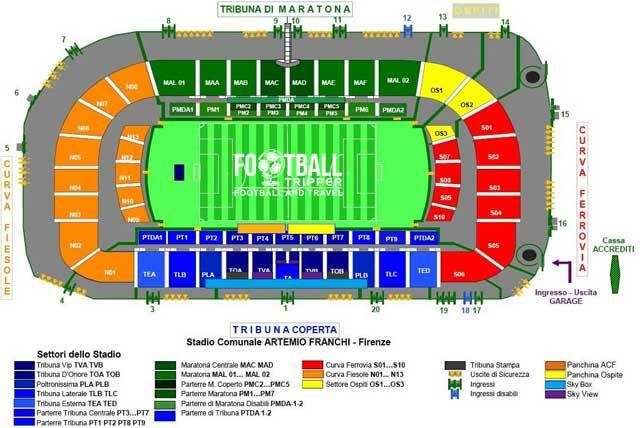 Identifiable on the seating plan by looking for the Settore Ospiti section (Industry Guests) which is marked in yellow, the seating section is sandwiched between the Tribuna Di Maratona and Curva Ferrovia aka. The Railway End. Views from the stand are generally ok you have to remember that there is a running track which adds distance.Whilst the lower section of seating is technically closer, the views are arguably more clear from the second-tier as it gives you a better overview of the action on the pitch. Located within the Coverciano neighbourhood you will undoubtedly encounter a few local bars and restaurants whilst making your way to Fiorentina’s ground, however nothing will match the choice you will find in the centre of Florence. The map below outlines a few of the most highly-rated bars in the city. Following on from the aforementioned paragraph about bars, the advice also applies here; you will find some smaller cafes and restaurants on your way to the ground but not as much as you will in the city-centre where they generally open late into the night. Inside Artemio Franchi, there isn’t much food and beverage to be found inside – particularly when compared to English stadiums so make sure you grab snacks before the match. The club shop (FiorentinaPoint) at Stadio Artemio Franchi is located on 85/A Viale Manfredo Fanti which is the road which runs behind the Curva Nord. With the exception of the Fiorentina Online Store it is easily the best place to purchase official merchandise on matchdays. Matchdays: Open for a few hours either side of kick-off. There are also shops which sell Fiorentina merchandise within I Gigli Shopping Centre and at 25-33 Via Ricasoli in the centre of Florence which is known as Soccer Town Shop. Currently the club does not offer tours of the Stadio Comunale Artemio Franchi but if you arrive on matchday you can take a good look at it then. It is a very bare stadium with a lack of décor about it with exposed stands, no shiny façades and no commercial leanings. Tickets to see ACF Fiorentina can be purchased online, from one of the Fiorentina Point Stores, at one of the authorised resellers around the city or at the box office at Stadio Artemio Franchi in the days leading up to the match. The opening times for the Fiorentina Point at the stadium are listed above in the “Club Shop” section, however in addition to this the box-office is open between 9.30 am – 1.00 pm on Saturdays and from 9.30 am until kick-off on Sundays providing there is a match on either day. Please remember to bring your ID otherwise you may not be able to purchase a ticket! 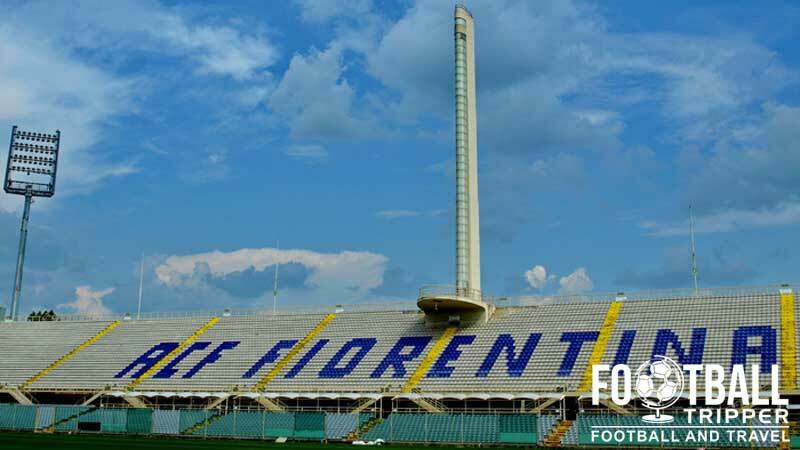 Fiorentina’s stadium is located just under 3km north-east from Florence’s traditional city centre where the iconic Ponte Vecchio, The Old Bridge, spans over the Arno River. The stylish exterior of Artemio Franchi’s main stand. Designed by Pier Luigi Nervi who also worked on the famous Pirelli Tower in Milan the shape of the ground was said to resemble a D in a coincidental reference to Mussolini. From the city centre a taxi will take around 15 minutes and will likely set you back anywhere between €10.00 – €20.00. Parking around the immediate environs of the stadium is free, however unless you’re use to driving in Italy it can be a very stressful experience as cars typically don’t leave much room between spaces. Make sure you get there early to make it easier for yourself, and failing this you can find parking garages as you get close to the city centre. The closest station “Firenze Campo di Marte” is only 400 meters away from Fiorentina’s stadium and can be caught from Santa Maria Novella station in the city centre less than 10 minutes away from The Duomo. Campo Di Marte is the closest station to Fiorentina’s ground at less than half a kilometre away and can be caught with ease from the city centre on matchdays. From either Santa Maria Novella or San Marco Square stops take number 7, 17 or 20 to get to the stadium. Taking approximately 20 minutes, the bus is relatively cheap and has the added bonus of extra services being put on for matchdays. The closet airport to Florence is the Aeroporto di Firenze-Peretola, located less than 5km away which makes planning a weekend away pretty easy. Once you have landed you can catch a bus service which departs every 30 minutes or so. If you are travelling with a low cost airline double check whether or not you will be landing here or at Pisa International Airport (Galileo Galilei Airport) as it is sometimes marketed as Florence. This is around 1 hour away from the stadium and requires you to catch a train service which whilst not the end of the world, is definitely worth avoiding if possible! The ancient city of Florence is relatively compact meaning that you shouldn’t feel too location conscious when booking your hotel. There are generally more options North of the River Arno but this doesn’t necessarily mean it’s better. Three of the highest rated hotels by customers are the Grand Hotel Cavour, Hotel David and the Hotel Duomo.